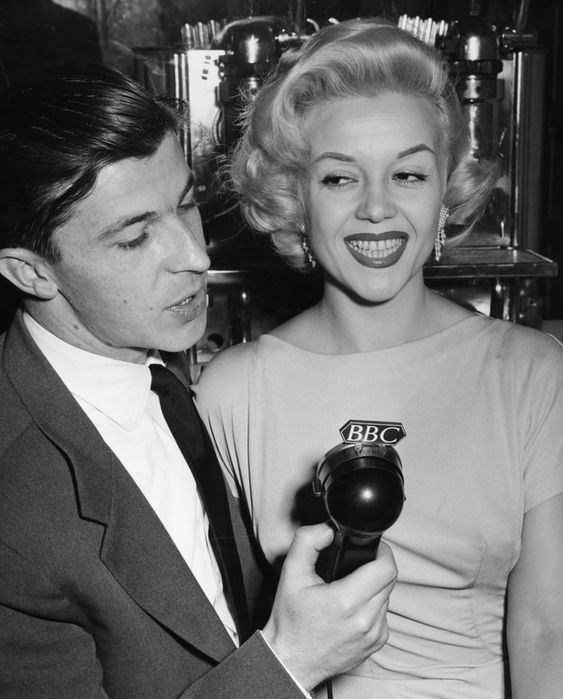 From the earliest days of outside broadcasting and recording, keeping the microphone dry has always been something of a challenge. Condenser microphones in particular don’t function well in damp conditions, and pretty much any mic can be completely ruined by a good soaking. These days’ companies such as Rycote make windshields and water resistant protection to cover a wide range of different professional microphones. Back in 1955 STC came up with their own neat and convenient solution to the problem. 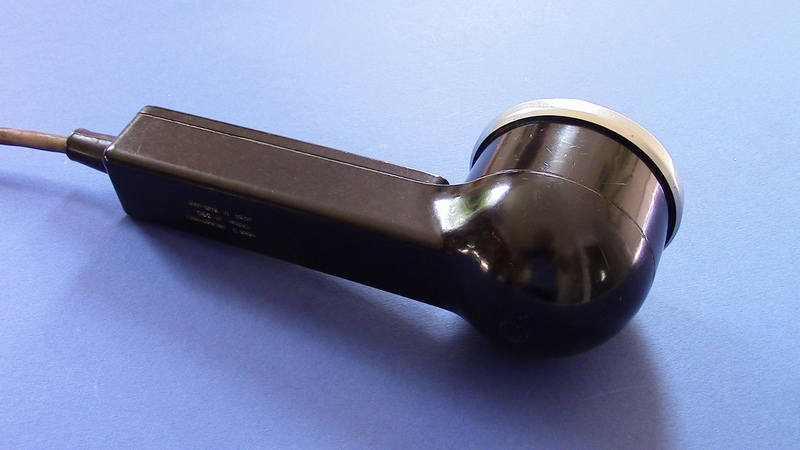 Advertised rather grandly as being ‘an all weather instrument’ with ‘full marine and tropical protection,’ the STC4032 is a robust hand-held, omnidirectional, dynamic microphone with a moisture resistant black Bakelite body. The grill is a dual layer of fine stainless steel mesh and an optional windshield (pictured above) may be added to give an additional 15db noise free performance in high winds and additional protection from the rain. 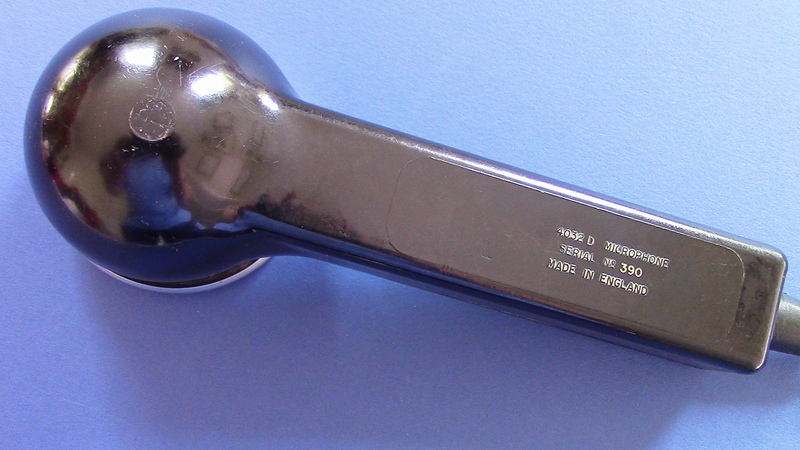 The handle incorporates a switch, which can be wired to provide muting or remote start/stop function for a tape recorder (such as the E.M.I Midget). This super lightweight setup was used by BBC outside broadcasters from 1955 until the mid-60’s and weighed a mere 14lbs! You may laugh…….. 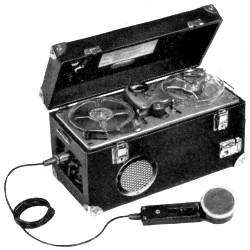 But this was a vast improvement on carting round the previous equipment…….. a BBC Type C portable disc recorder weighing 44lbs!!! (see pic below) Perfect for recording in a gondola! 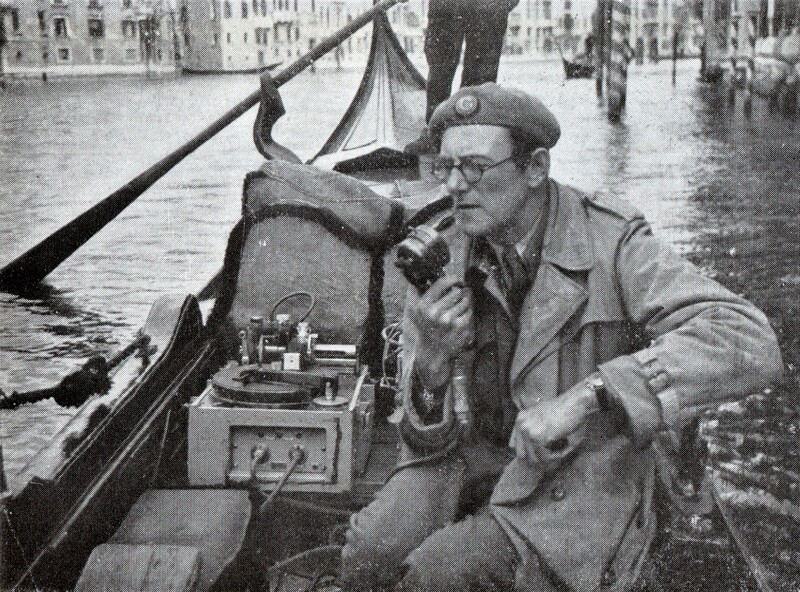 Michael Reynolds reporting for the BBC in Venice 1946. 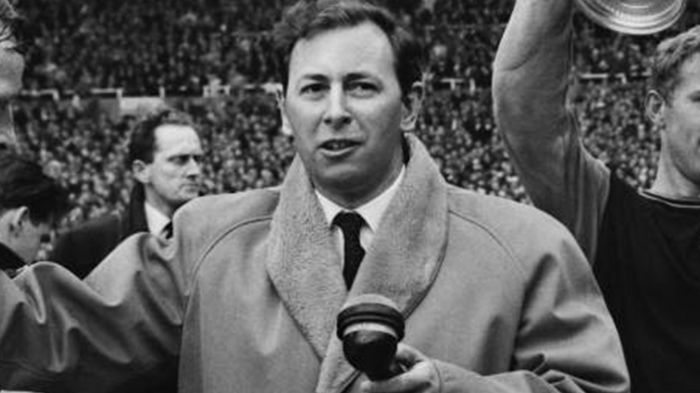 Legendary sports commentator David Coleman with his trusty STC4032 in hand. 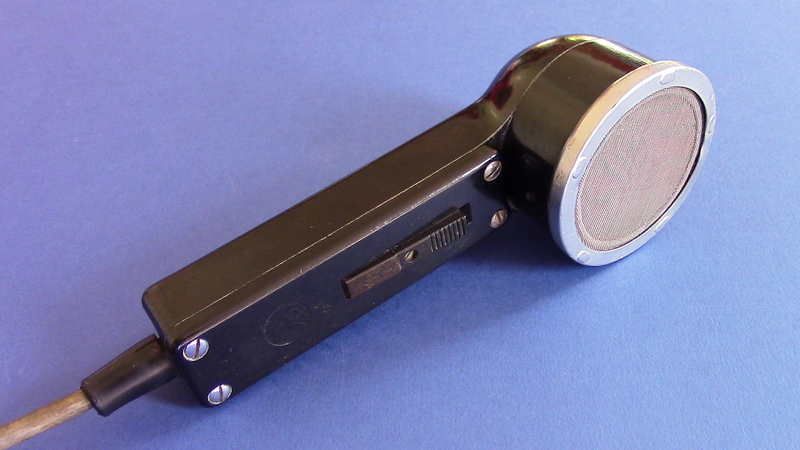 Although it looks somewhat like a World War 2 battlefield telephone, in terms of technical performance the STC4032 is exactly the same as the STC4035 studio microphone, and very similar to the famous Apple & Biscuit STC4021. It has a notably smooth frequency response from 30Hz to around 10 kHz, with a presence peak of around 5db at 6.5kHz . The only difference with the 4032 is the water resistant case. 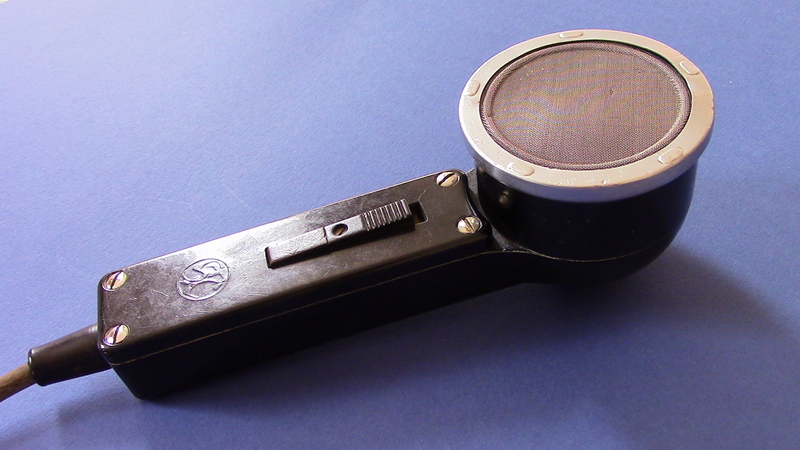 Although ostensibly designed for outside broadcasting, the STC4032 is a high quality dynamic microphone that could be used for many different tasks. 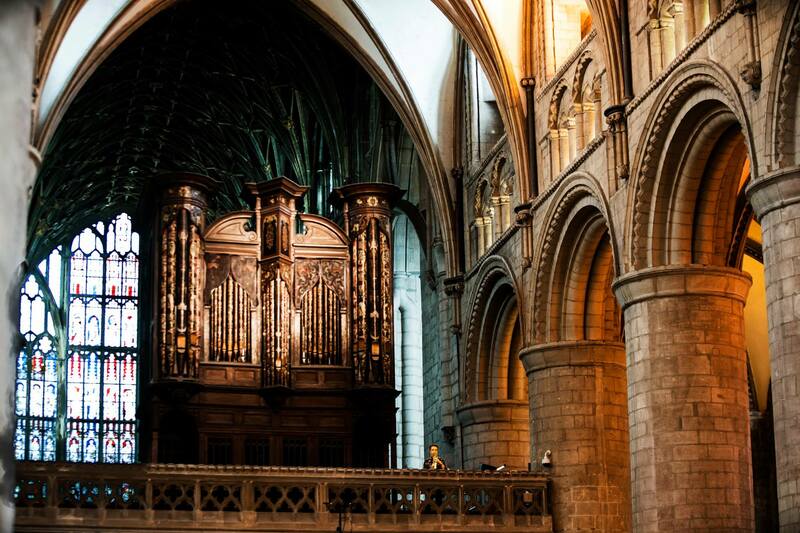 Click Here for a short except from Suite for Soprano Saxophone and Church Organ – ‘In Remembrance’ composed and performed by Patsy Gamble with Jonathan Hope on Sat 11th Aug 2018 in Gloucester Cathedral. Photograph by Duncan Laker. Click Here for a short clip of Acoustic Guitar. Many thanks to Joe Martin for the brief impromptu solo. 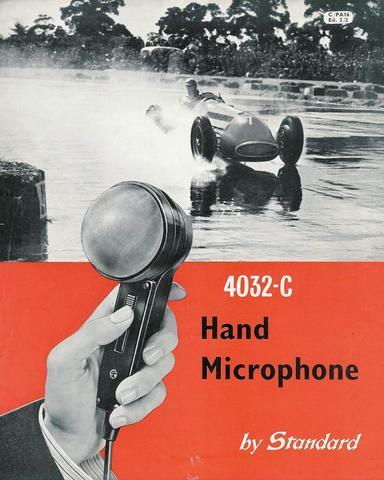 This entry was posted in 1950's Microphone, 1960's Microphone, BBC Microphones, Microphone Tech Specs, Microphone techniques Ancient & Modern, STC Microphones, Uncategorized, Vintage Broadcasting, Vintage Brochures and Tech Specs, Vintage film recording, Vintage Microphones and tagged 1950's Microphone, 1960's Microphone, BBC Microphones, BBC outside broadcasting microphone, Microphones for Television, STC Microphone, Vintage Microphone. Bookmark the permalink. AKG D12. The Best Bass Drum Microphone In The World? Sennheiser ”Telemike” (Circa 1976) with ME20, ME40 & ME80 capsules. Season’s Greetings to All and A Happy New Year! A Rare Siemens (? )/ Telefunken (? )/ Klangfilm (?) Microphone.